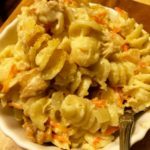 Tuna noodle casserole is sort of the epitome of comfort food – creamy pasta, cheesy tuna, savory veggies… it’s just as good warmed up the next day as it was when it came out of the oven. It seems especially appropriate on damp days and when life gets challenging. I like to skip some of the more traditional ingredients (cream of what?) and make a basic 3/3/3 cream sauce (that’s 3 T butter, 3 T flour and 3 cups of milk!) and then add actual real mushrooms to the party. I have a particular fondness for seasonal chanterelles but feel free to use white or crimini mushrooms as well. My least favorite thing about the standard tuna noodle recipe is the peas. 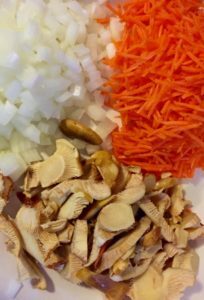 I much prefer the sweetness and firm texture of a fresh carrot, and this time of the year there’s still a few coming out of the garden/farmer’s markets so it’s a good opportunity to add yet another local ingredient to your dish. My policy is to get as much local into my dishes as I can, so… carrots it is! 6 oz can albacore tuna local, please! Preheat your oven to 350, and find yourself a nice casserole dish to spoon everything into when it’s ready. You can really do this in any order, but I start with the veggies! In a sauce pan, melt the three tablespoons of butter over medium heat, and then whisk in the three tablespoons of all purpose flour. Let that cook, stirring occasionally, for about 5 minutes or until it turns slightly more golden in color. In the meanwhile, warm 3 cups of milk (I used 2%, but whatever you have on hand should be okay!) either on the stovetop or in the microwave for about 2 minutes. 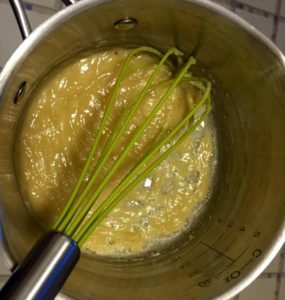 When the butter and flour roux is ready, whisk in the milk by pouring a small, steady stream until it’s all incorporated. Continue cooking to a simmer and stirring until thickened. Salt and pepper the sauce, then pour into the vegetables. Cook your pasta! I take about a minute off the most modest time estimate to be sure that it doesn’t get overcooked coming together in the oven. When the pasta is done, drain and toss that into the big pan as well. 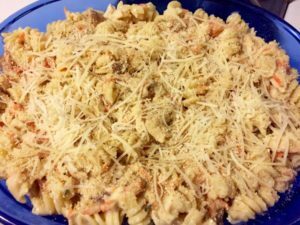 Open your tuna and flake it a bit with a fork before adding it to the mix – local tuna is usually canned in actual filets, (yay!) so in order to get a bit of tuna in each bite you’ll want to break it up a bit. Be sure and get any juices from the can into the pan as well – that’s great flavor! Lastly, add the parmesan cheese and a generous sprinkling of salt and pepper. Fold carefully to combine, then transfer to the casserole pan. Cover your dish with foil, and bake for about 20-30 minutes or until everything is warm and bubbly. Voila! If you like a crunchy texture you can remove the foil and add some panko breadcrumbs or fried onion straws for the last 5 minutes of baking time. We often add just a little more cheese during this time as well, just to get some color and texture on the top. YUM.